Come out and ride from 10am-6pm for FREE!!!!! 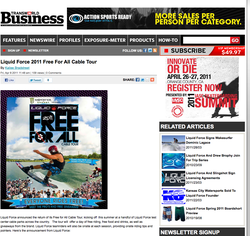 Liquid Force’s Free for All Cable Tour is back! With a goal of introducing the sport of wakeboarding to new people, Liquid Force has teamed up with Monster Energy, Spy Optics, Supra Boats, New Era, Skullcandy,TransWorld WAKEBOARDING to offer a series of ride-for-free days at cable parks across the country. Each Free For All participant will have the opportunity to demo all new 2011 Liquid Force wakeboarding gear, and multiple Liquid Force team riders will be on hand to give pointers and riding tips. Chipotle and Monster Energy will be providing free food and drinks, and each participant will have an opportunity to receive free giveaways from Skullcandy, Monster Energy, Spy Optics, Supra Boats, New Era, Vertra, and Transworld WAKEBOARDING. Local Band Taste Bud G Spot will be out at KCW playing at Free 4 All! They are a 4 piece band based out of Olathe. Their sound is a diverse mix of modern and roots reggae, dancehall, ska, and rock music. Band members include Jt Milner on the drums, Jon Liggett on the guitar, Aaron Anderson on keys/vocals/percussion, and Taylor Sanders on bass. Smokin' But Not Inhalin' BBQ will have the grill blazing throughout the day!